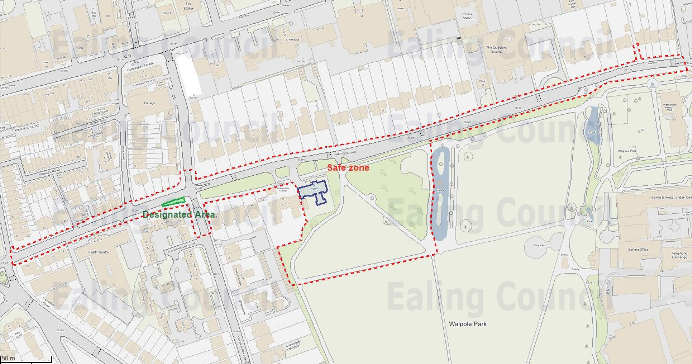 Ealing Council is asking for views on a proposed Safe Zone outside the Marie Stopes clinic on Mattock Lane. The Public Spaces Protection Order (PSPO) is being proposed in Ealing to stop harassment and intimidation for women visiting the clinic and also improve the quality of life for residents. The proposed area is the length and breadth of Mattock Lane and will prohibit within that area people from congregating, displaying images and from approaching or monitoring people accessing the clinic. The council is particularly keen to hear the views of people who live, work or visit Mattock Lane or the immediate surrounding areas as well as clinic users and staff. Following the council’s research and investigation into the issue of behaviours of groups outside the clinic, a report was presented to cabinet members on Tuesday, 16 January 2017, where members agreed to proceed with an eight week consultation. Councillor Ranjit Dheer, cabinet member for community services and safety, said: “Our research has shown that the Ealing community would welcome the idea of enforcement action being taken against those committing anti-social behaviour in the area. PSPOs are designed to discourage anti-social behaviour from happening in an area by barring certain behaviours. If the PSPO is breeched council officers and the police would have additional powers to take enforcement action to tackle anti-social behaviour within the area. The consultation is open from Monday, 29 January and will finish on Monday, 26 March 2018. If you would like to know more and share your views about the proposed PSPO please do so via www.ealing.gov.uk/safezone. If you have any further queries or feedback about the proposed PSPO, please email SaferCommunities@ealing.gov.uk or call 020 8825 5994. Once this consultation has closed, the council will collate all the feedback and review then present to cabinet to decide if a PSPO should be implemented. If approved, the PSPO will come into effect in April 2018. 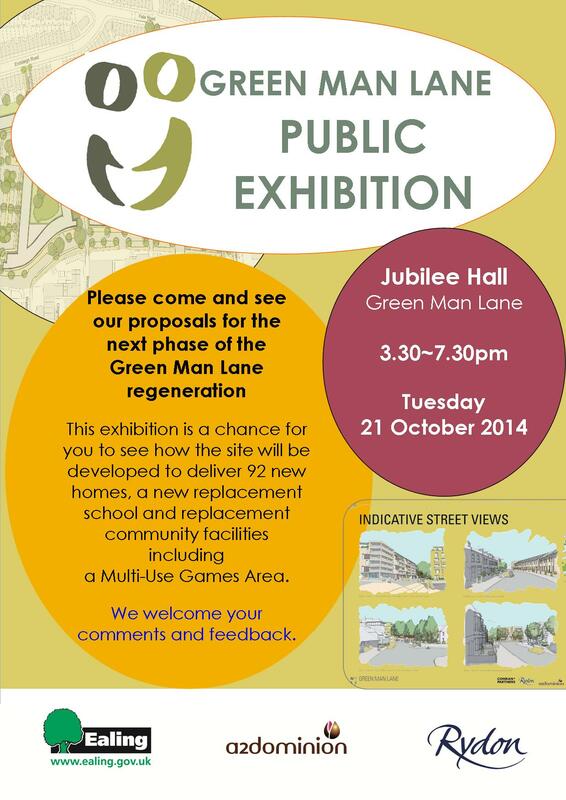 The regeneration of the Green Man Lane Estate is one of the most important developments in West Ealing for a generation. Here’s your chance to see plans for the next phase which will deliver 92 new homes, a new school for St John’s and new community facilities. Purpose: To show visitors how the St John’s Primary School site will be developed to deliver 92 new homes, a replacement school and replacement community facilities including a Multi-Use Games Area. 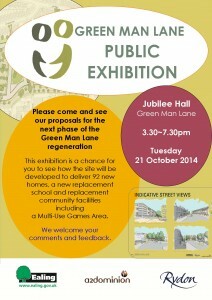 Representatives from Rydon, A2Dominion and Conran & Partners will be on hand to discuss the proposals. Congratulations to West Ealing Centre Neighbourhood Forum (WECNF) which was formally designated by the council last month. WECNF will now work on presenting a detailed 15-year spatial plan for the centre of West Ealing which could affect all our lives. It will be a plan that comes from the people who work and live in the centre of West Ealing, that’s unpaid volunteers who care deeply and personally about the space we all share. Consultation about the content of this plan, will include a touring ‘play-let’ written by and starring people of West Ealing and all about West Ealing. It will be about 30mins long – so watch this space for news of venues. Next WECNF meeting is Thurs, April 18th at st John’s church, 6.15pm; then Friday 17 May at the mosque, 6.15pm. All welcome. http://wecnf.wordpress.com/ . It’s not smart, it’s not clever – but it is BIG and also unique and imbued with a huge thank you from local members of the West Ealing community. 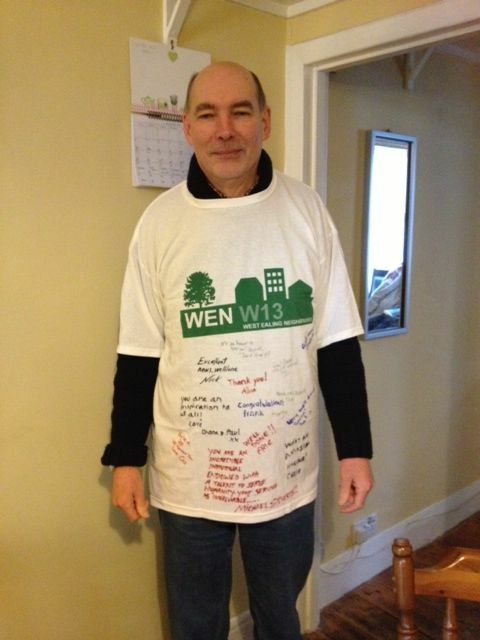 WEN’s chair David Highton was cited in this year’s New Year Honours for his contribution to our community in West Ealing which, as most of us know, is considerable. So local neighbours and tradespeople signed a logo’d T-shirt and thanked him and toasted him in a small local celebration. No royalty were present and he maintains he’ll wear a smart suit and shirt when he receives his well-deserved British Empire Medal later in the year. According to a story on the Ealing Today website, a fight this morning at the bus stop outside The Gym (old Daniels building) led to one man being stabbed. It doesn’t sound life threatening fortunately. The police have increased foot patrols in the area. 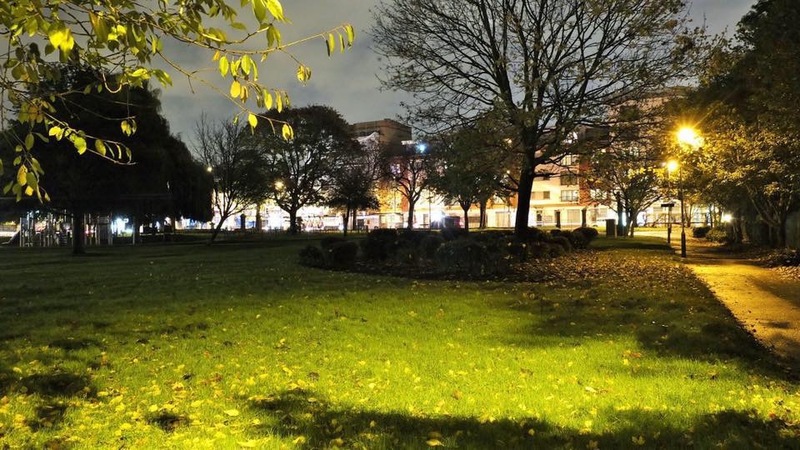 Unfortunately, there has been a run of serious incidents in West Ealing over the past months with the most recent – a fight between two gangs – just before Christmas. The whole question of local law and order will be looked at in WEN’s January newsletter which will be published on Friday and will be on our website from then. 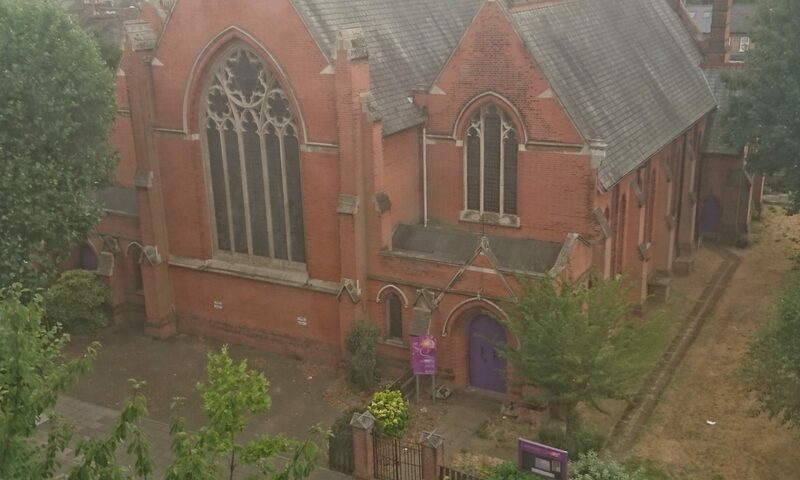 West Ealing’s very own arts centre has much to offer. For a full programme, including a quiz night, book club, pass on a poem, a talk on Hindi cinema, and guided trips to inspirational building interiors, go to www.openealing.com . “Wow, 30 jars of honey!! That’s amazing. I hardly had any from my hives this year”. That comment from an experienced bee-keeper in Suffolk was a real testament to the good fortune we had with the hive in the Walmer Gardens orchard (helped along by a bit of skill, dedication and enthusiasm from our beekeepers too). An encounter with Sarah Dye during an Abundance blackberry-picking session led to my involvement with the Ealing Transition Community Bee group, which Sarah was setting up. 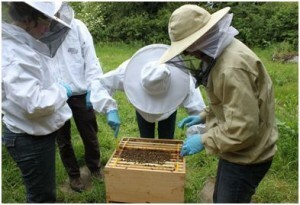 Our bees arrived in April this year and over the spring and summer months we carried out weekly inspections of their hive. We checked to see if the queen was present, if there were eggs, and if the eggs were turning into adults. It was amazing to see the workers (female adults) bring in the pollen in such a fantastic array of colours, and they managed this despite the appalling summer weather. And of course one of the most rewarding and exciting things for us novice beekeepers was being able to take our wonderful crop of honey in August. As the cold weather descends we ensure that the bees have enough food to get them through the winter; and we look forward to next year, with hopefully a good harvest for us, and my friend in Suffolk too. Congratulations to Cultivate London for winning the Producer of the Year award in the 2012 Observer Food Monthly Awards. In the company of Hugh Fearnley-Whittingstall, Nigel Slater and Sir Terence Conran as prizewinners, Cultivate London was set up and is funded by West Ealing based charity Pathways. Cultivate London converts derelict land in to urban farms to grow herbs and plants. It has two sites in Brentford and you can find its produce at the weekly farmers’ market in West Ealing in Leeland Road. The Ealing Today website has a fuller version of this story. 300 people packed Victoria Hall at Ealing Town Hall last night (26 September 2012) and vented their fury at NHS plans to decimate healthcare services at Ealing Hospital and throughout the north west London region. Residents, Councillors, NHS staff, trades unionists and MPs were massively critical about the contents of the plans and the inadequacy of the public consultation. It appears that the risk assessment and the equality impact assessment are both flawed and incomplete. Emerging from the fog of rhetoric from NHS bosses it is now crystal clear that the NHS wants to re-purpose Ealing Hospital as (what we all view as) just a clinic. No more babies would ever be born at Ealing Hospital – truly ironic now as Ealing Hospital Maternity Unit is the best performing one in the whole region. The sick, wounded and dying will be turned away from its doors for treatment. Nine of the 11 major types of healthcare services will be axed at the hospital. A massive consensus emerged quickly amongst the audience that whatever the NHS bosses said to the contrary, the proposed cuts were about cutting £1 billion from the region’s NHS healthcare costs by 2015. 5,600 people will lose their jobs and there will be fewer hospital beds available.To dress up what might well be good intentioned aspirations as ‘proposals to improve your local NHS services’ was viewed with much cynicism by the meeting attendees. Ealing Hospital is in so many ways Southall Hospital. Southall residents and Ealing Hospital staff over and over again voiced their horror at the planned destruction of their hospital. Southall has the highest rates of diabetes, tuberculosis and coronary disease in Ealing. Of all hospitals in the region, Ealing Hospital is the one most used by its immediately local residents. A Cardiologist at Ealing and Hammersmith Hospitals claimed that the serious healthcare problems in Southall had existed for 20 years but had never been addressed. He said that he and many, many of his medical consultant colleagues believed that the plans are unworkable. A lady spoke who had worked at Ealing Hospital Accident and Emergency for 25 years. She was concerned about Southall’s hidden population ie illegal immigrants. If Ealing Hospital effectively or actually closes down just how and where will the thousands of hidden (‘beds in sheds?’) population receive treatment she asked. A Southall Councillor claimed that 10,000s of Southall residents without internet access and/or English language skills were being excluded from this public consultation. He asked for many more translations of the 80 pages proposals and the 15 page response form. Southall Library was supplied with just 50 copies of the consultation and response form documents. This was clearly totally inadequate for the 70,000 who live in Southall. He requested a three month extension to the consultation period. An NHS boss declined his request. Three of the eight (yes eight) proposed ‘care settings’ is what many might call community healthcare. This is called ‘out of hospital’ by the NHS and comprises (in NHS jargon) GP practices, a care network (whatever that might be) and health centres. Many residents and NHS staff voiced very real concerns about why there were no details at all about how and where this community ‘out of hospital’ care would take place and the resourcing and facilities needed to provide this care.. The NHS said that their research states that average journey time from patient pick up to delivery to a hospital in London(or Ealing perhaps?) by ambulance with blue lights flashing was 11.4 minutes. The maximum journey time was 30 minutes. These figures were met by howls of derision. No figures were provided as to the average waiting time for an ambulances in Ealing or the projected waiting times for an ambulance should Ealing A&E close down. A Hanwell Councillor made the point that many of us drive our sick loved ones to Ealing Hospital, and with no flashing blue light travel times to Ealing, Hillingdon, Northwick Park or West Middlesex Hospitals would be much longer. He asked NHS bosses what percentage of Ealing Hospital A&E admissions were delivered by car/taxi? No answer was forthcoming. A lady weighed in with the fact that you need to use three different bus services to get from Southall to Northwick Park Hospital. Many made the point that healthcare travellers are not just patients but family and friends. Research showed that regular attendance by loved ones at hospital bedsides speeds up the process of recovery from illness and injury. A resident of Harrow pointed out that the proposed radical restructuring of healthcare provisioning in our region has not been attempted anywhere else in England. The NHS has admitted that there is no evidence at all that this strategy could or will work. No-one in the audience had any evidence that Ealing GPs supported the proposed changes. This is ironic as in April 2013 Ealing GPs (in the nascent NHS Ealing Clinical Commissioning Group – ECCG) will take over from the NHS Ealing PCT and run Ealing NHS healthcare. A GP actually questioned why Ealing GPs had not been asked their opinions on the proposals by the ECCG. As the ECCG Chair was absent no answer was forthcoming. NHS – Are You Listening? 40,000 people have signed petitions opposing the cuts. On 15 September 2012, 1,000s marched through Ealing Town centre and even more rallied on Ealing Common to show and voice their opposition. All the region’s MPs, Councillors, Councils, Trades Unions and many, many residents’ and community groups have voiced their opposition to the proposed cuts. Billed to appear as a speaker was Dr Mohini Parmar, Chair Ealing Clinical Commissioning Group (ECCG). This NHS GP Commissioning Group will replace NHS Ealing PCT and run NHS healthcare in Ealing in just seven month’s time. But, she was nowhere to be seen. The local MP Angie Bray was also absent. A speaker from the floor suggested that if Ms Bray was truly serious about resisting the proposed cuts (which the speaker fervently believed emanated from the Tory lead Government’s plans to save £20 billion annual NHS costs) she should resign if the cuts went ahead. Given that the meeting was one the largest (perhaps the largest) public debates on the restructuring of healthcare for a generation, across 100 square miles and applicable to two million people in London, London Mayor Boris Johnson should have attended the meeting. Many asked why Mr Johnson is so quiet on this life and death issue of healthcare in the capital. Ealing Council has commissioned a former NHS Chief Executive Tim Rideout to carry out an urgent, independent review of the NHS NW London plans. Ealing Council announced last night that Mr Rideout’s view is that the plans are not robust and are therefore unsafe and open to challenge. A draft of the review exists now but the final version will be placed in the public domain by 5 October 2012. Has the NHS Got It Right? Numbers and percentages were thrown around like confetti both by NHS bosses and by those opposing the changes. Clearly the numbers (beds, nurses, clinicians, costs, admissions, travel times etc) are very important. But the overwhelmingly the feeling I had as I left the meeting was that we were all being asked to take part in a huge, unprecedented, human experiment – and none of were confident that it was all worth the risk.